The Padrino in Sivaswami Salai in Mylapore offers a big, fat menu of salads, starters, pasta, hot dogs and burgers. But what you need to check out is their mammoth 30 inch pizzas. Plus, they also do dessert pizzas. The pizzas here come in different sizes — from a 9 inch to a 12 inch, and then there are the 18-inch ones to the whopping 30-inch pizzas. You can even customise the pizzas by asking for different flavours and toppings. 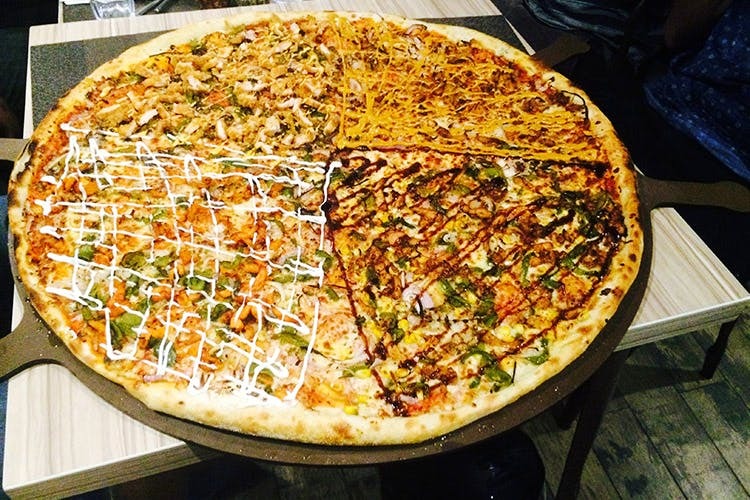 Each of these pizzas can be easily shared between five people. They do fun seafood pizzas with fried calamari, for meat lovers, there are chicken or beef options with everything from pesto to barbecue and even Punjabi tandoori flavours in between. Popularly known for its large pizzas, it also has other continental dishes and desserts like crème brulee and a selection of gelatos. By popular demand, they now serve American and Mexican dishes too. The Padrino’s selection of dessert pizzas are also worth a mention. Take your pick from Eclair Cream Pizza (with chocolate cream and cut fresh fruits) to Fresh Cream Pizza Fargola (pizza topped with fresh cream and strawberries). Yum! Even on lean days, The Padrino is always packed with college students, families and big gang of friends. We recommend you book a table before you go because of the exuberant crowd which flocks this outlet, especially during the weekends.